Researchers have learned to combine up to eight different metals in a single tiny, uniformly mixed nanoparticle. In the March 30 cover article of the journal Science, the researchers, from Johns Hopkins and three other universities, reported that their new technique enabled them to combine multiple metals, including those not usually considered capable of mixing. This process has created new, stable nanoparticles with useful applications in the chemical and energy industries, the researchers said. Many industrial products like fertilizers and plastics are made with the help of catalysts, substances that speed up chemical reactions. Metallic alloy nanoparticles — particles ranging from about a billionth to 100 billionths of a meter in size — are a critical ingredient in such processes. Until now, however, only a small set were available because of limitations that arise when combining extremely different metals to form homogeneous alloys, which are combinations of metals. The problem is even more challenging when downsizing to the microscopic nanoscale required for catalytic applications. The new method uses shock waves to heat the metals to extremely high temperatures–2,000 degrees Kelvin (more than 3,140 Fahrenheit) and higher–at exceptionally rapid rates, both heating and cooling them in the span of milliseconds. The metals are melted together to form small droplets of liquid solutions at the high temperatures, which are then rapidly cooled to form homogeneous nanoparticles. The new materials, known as high-entropy-alloy nanoparticles, are expected to have broad applications as catalysts in industry-relevant chemical reactions, with the potential to improve energy efficiency in the manufacturing process and lower production costs. "This method enables new combinations of metals that do not exist in nature and do not otherwise go together," said Chao Wang, a Johns Hopkins Whiting School of Engineering assistant professor of chemical and biomolecular engineering and one of the study's co-authors. Wang's research group designed a five-metal catalyst based on these high-entropy-alloy nanoparticles and demonstrated superior catalytic performance for selective oxidation of ammonia to nitrogen oxide, a reaction used by the chemical industry to produce nitric acid, an important chemical in the large-scale production of fertilizers and other products. 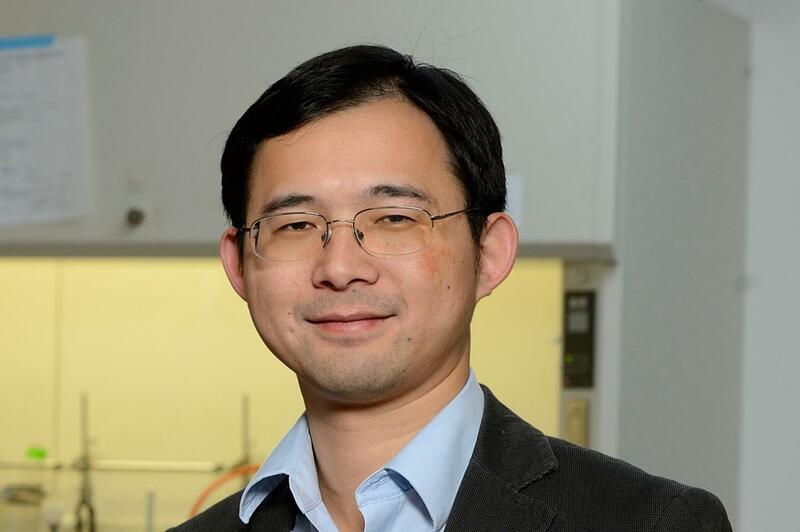 The work in Wang's lab was part of a collaboration with colleagues from the University of Maryland, College Park; the University of Illinois at Chicago; and MIT. The process allows the uniform mixture of a wide variety of metals, while also producing the alloys in the form of the tiny particles needed for the catalytic process. Traditional methods, which rely on relatively slow and low-temperature heating and cooling techniques, often result in clumps of metal instead of separate particles. To create their nanoparticles, researchers loaded metal salts–formed by a reaction between a metal and acids such hydrochloric acid and sulfuric acid–onto carbon nanofibers, a conductive supporting material commonly used in catalysis. They used an electrical pulse similar to a short circuit to shock the metal salts with heat and controlled the mixtures' kinetic and thermodynamic properties by adjusting the cooling rate. Synergistic effects among the dissimilar metals permit unprecedented catalytic mechanisms and reaction pathways. In addition to nitric acid production, the researchers are exploring use of the nanoparticles in reactions like the removal of nitrogen oxide from vehicle exhaust. This research had no direct funding support. The Johns Hopkins team acknowledged internal support through the university's Catalyst and Discovery Awards program. The acquisition of equipment was supported by National Science Foundation grant DMR-0959470. The authors acknowledged additional support from NSF grants CMMI-1619743 and DMR-1410636; a Department of Defense National Defense Science and Engineering Graduate Fellowship; and an Office of Naval Research Multidisciplinary University Research Initiative grant. Color photo of Chao Wang available; contact Phil Sneiderman.